If you’re looking for a completely unique party experience this year, give your little outlaw a Wild West Adventure! 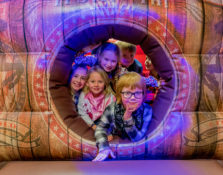 ALL our birthday parties have EXCLUSIVE use of the Wild West play village and we offer three different packages – the ‘Rowdy Round-up’, ‘Little Indians’ and the infamous ‘Golden Nugget’, which are all detailed below. However all packages are flexible, so if there’s something in particular you’d like, just give us a holler! A Rowdy Round-Up party is available Tuesday – Sunday and costs £16.50 per child (minimum 15 children, maximum 28). Our unique Wild West party invitations and posters, personalised with the name and picture of the birthday boy or girl. Sheriff Party Cones (party bags) at £2.50 each. Available Tuesday – Friday only, the Little Indians party is for up to 12 children and costs £180. This is the perfect package for little ones to share a birthday celebration with a few of their friends from nursery or pre-school! The Little Indians is also popular for after school parties, with the last party time during the winter being 4 p.m. – 5.30 p.m. and in the summer months 4.30 p.m. – 6 p.m. The package is the same as the Rowdy Round-up, but with exclusive play for up to 60 minutes. Want to invite the whole class? Choose our GOLDEN NUGGET Party Package for 28 little outlaws! World of their Own is located at Grass Roots, Bishop Monkton near Harrogate, HG3 3QD.